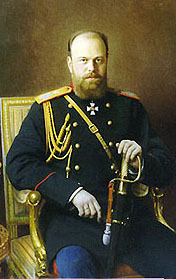 Both of the last two Russian tsars, Alexander III and Nicholas II, were absolutely impeccable fathers and family men, they were not, however, good at solving Russia's problems, which were accumulating rapidly at the end of the nineteenth/beginning of the twentieth centuries. Please read the Sample Historical Document Analysis, based on some excerpts from Hammurabi's code of law. The sample illustrates some of the questions that a historian asks when reading a historical document. This is what you will be doing in this course. Read Petr Stolypin's "We Need a Great Russia" speech to the Russian Duma in 1907. This was an important policy proclamation in which he set forth his plan for revamping the Russian countryside. Log into Blackboard and look for the speech under course documents. Read chapter 25 and chapter 26 from Mary Platt Parmele (1843-1911) A Short History of Russia (1907, 4th edition). I will include some excerpts from this old textbook in the first two Units of HIS 242, since Parmele provides a rather standard (and interesting) impression of Russian history from the early twentieth century, before the Bolshevik Revolution. This is optional reading. If you wish you can download the entire book (alternate site *.zip download). In H. W. Williams, Russia of the Russians (New York: Charles Scribner's Sons, 1915), consider reading any of these chapters: The Bureaucracy and the Constitution, The Press, Church and People, Peasants and Proprietors, Trade and Industry and In the Chief City [St. Petersburg]. Williams was a newspaper correspondent in Russia who married a politically-active Russian liberal woman. His book, though almost a century old, is well-written and very much reflective of pre-World War I sentiments. He made some very interesting observations about Russia in his book. For 50 points maximum extra credit, take a look at the 1897 map of St. Petersburg. In a one-page paper, explain what you can discover about St. Petersburg at the time from looking at and analyzing this old map. For 50 points maximum extra credit, watch Dersu Uzala (1975). What does the movie tell us about earlier Russian society, in a one-page paper? For 50 points maximum extra credit, watch Fiddler on the Roof (1971) and explain in a one-page paper how Jews did /did not get along with Russians at the turn of the century? For 50 points maximum extra credit, read Edward Judge, Easter in Kishinev: Anatomy of a Pogrom (1992) and write a one-page paper, "What were the government's motives in instigating the pogroms?" For 50 points maximum extra credit, read Theodore H. von Laue, Sergei Witte and the Industrialization of Russia (1963) and write a one-page paper explaining the "Witte system" of economic modernization. For 50 points maximum extra credit, read Robert Massie, Nicholas and Alexandra (1967) and write a one-page paper explaining what went wrong in Russia under Tsar Nicholas II. For 25 points maximum extra credit, read a newspaper account of the Kishinev pogrom and write a paragraph explaining the impact of the pogrom on Kishinev. For 25 points maximum extra credit, read the Franco-Russian Alliance Military Convention (1892), and write a long paragraph that answers the question, How did this convention fit into the pre-1914 diplomatic scene?